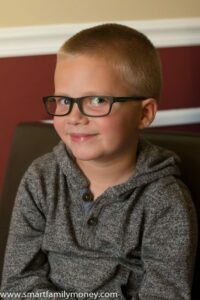 I wrote before about our experiences shopping for my son’s first pair of glasses. I compared the options for glasses at Walmart Vision vs Target vs Costco. After we got his first two pairs, I compared the quality of glasses from Walmart vs Zenni. My son loves his Walmart glasses and wears them every day. 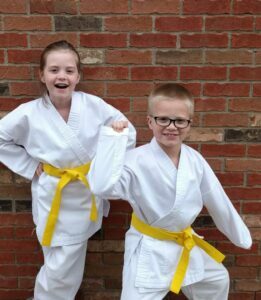 We never have to argue with him to wear them! Unfortunately, although he loves his glasses, he’s not the most careful with them. He’s a rough-and-tumble 7-year-old boy! I’m sure you understand that! My son loves his glasses, but he also loves to be active! As I feared, we’ve had to deal with scratched lenses and broken frames, both within the first 6 months. I really hate it when I’m right about this kind of stuff. You know what I mean, mamas? Thankfully, I had anticipated this and chose Walmart Vision, mostly for the Walmart Vision Center 12-month Replacement Guarantee. So how did it go with the Walmart Vision Center Warranty? A few months ago, we had our first incident with my son’s glasses. Somehow through rough playground playing, he got some deep scratches on the lenses. They were deep enough that you could feel the scratches and obviously see them. Since I knew the Walmart Vision Center 12-month Replacement Guarantee covered deep scratches, I confidently took them to my local Walmart for lens replacement. The technician took a look at the lenses and agreed that they scratches were deep, but questioned whether they were in the “field of vision” because they were slightly off to the side. She explained to me that she may get in trouble for replacing them if they’re not “bad enough”. I could come back the next day to talk to the manager OR she suggested that if they were to suddenly become worse, she could replace them. She was really suggesting that I take them out to the parking lot and step on them. Can you believe that? I did not feel comfortable doing something dishonest! I also didn’t want to completely destroy my son’s glasses when he’d prefer to wear them, even with the scratches. Instead of following the “smash them in the parking lot” suggestion, I decided to drive to another Walmart that was 10 minutes away. I don’t know about you, but there are PLENTY of Walmarts to choose from around my area. The vision technician at the second Walmart had no problems ordering new lenses. She took care of it right away. She told me to expect the lenses in a week, but they were ready in 2 days! They popped the new lenses into his frames and we were on our way. No cost! Overall, I felt that Walmart gave me a little more hassle over the lenses than was necessary, but they still followed through, and I was satisfied in the end. A few weeks ago, my son came to me with his glasses looking like this! He said he just went to put them on and they fell apart. While I’m sure constant rough treatment over time didn’t help, there wasn’t a specific incident that caused them to break. The earpiece just came off. One could argue that in this case, it was the low quality of the frames that caused them to break. I honestly feel like the frames are not low quality, though. They feel very sturdy to me. My son reluctantly wore his Zenni frames while I took his broken glasses to Walmart (the 2nd Walmart in the story above). I expected the replacement to take a few days. I was shocked when the technician told me that as long as they have the frames in stock, he can replace it immediately. He pulled an identical pair of frames from the display shelf, popped my son’s lenses in and handed me the fixed glasses! We had brand new frames in 15 minutes! Overall, I am thrilled with our experience with the Walmart Vision Center 12-month Replacement Guarantee. It’s doubtful many adults would have a reason to use it, but for young kids, it’s a wonderful service. I had hoped I’d be wrong about needing replacements, but unfortunately, I wasn’t. Have you hoped you’d be wrong before? I am so glad I chose Walmart over Target or Costco for my son’s glasses. I don’t think I’ll be shopping anywhere else for his glasses. Pay attention to the date of purchase. You have exactly 12 months to use the warranty, so if you’re getting close to that date and might qualify for a replacement, don’t delay. Also, this date does not reset after a replacement. My son’s warranty expires in October 2017 because we purchased the glasses in October 2016, even though his frames were replaced in April 2017. It doesn’t extend the warranty to April 2018. If they say no, try another Walmart. I don’t know about you, but I literally have FIVE Walmarts within 10 miles of my house. If one says no, try another! The reason for breakage doesn’t matter. Walmart doesn’t care how the glasses broke. I’m not suggesting you should stomp on them on purpose… but don’t feel bad asking for a replacement if the breakage was your fault. The reason doesn’t matter. 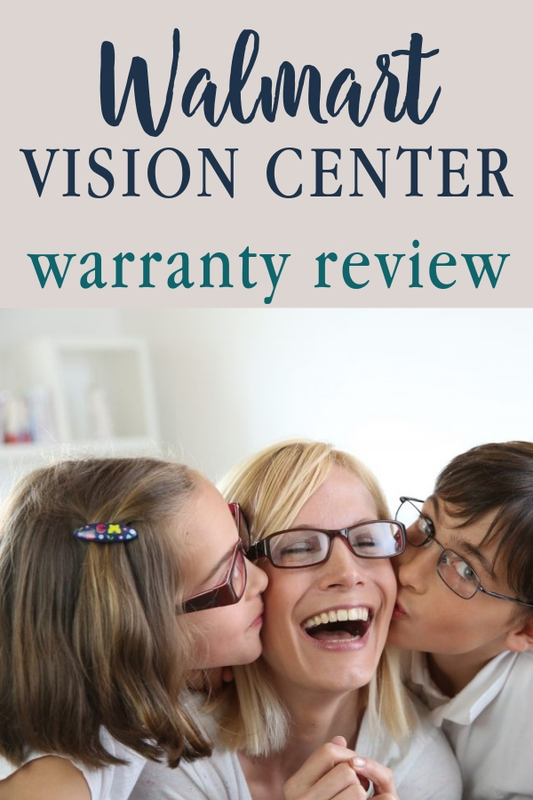 Have you used the Walmart Vision Center 12-month Replacement Guarantee? How was your experience? Please comment below! Previous Post: « Budget Category Percentages: How Do Yours Compare? I bought my eye glasses at Walmart. I had all the goody’s put on the lens. $280.00 worth. With in 3 mo. the anti scratch was coming off. I couldn’t even see threw them. Took them back to wal mart….. was told—Sorry about your bad luck but we can’t help you!!!!!!!!!!!!!!!!!!! No reason, no if ands or buts, just can not help you. I will NEVER buy glasses at the Poplar Bluff, Mo. wal mart!!!!!!!!!!!!!!!!!!!!!!! I completely agree that the Walmart Vision Center service is not always great. It seems to vary wildly by location. My advice in that situation would be to just drive to the next closest Walmart and see what they say. I hope you were able to make something work with your glasses! 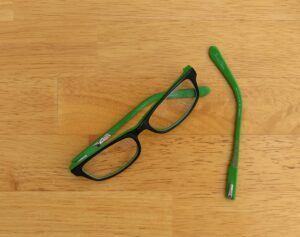 We used the warranty for my daughter’s glasses when she had scratched them and my husband accidentally stepped on them when my angry little girl threw them on the floor! They replaced the lenses and the frames no questions asked! They did require that the broken glasses be sent in and replaced, so we couldn’t even try to repair them while we waited. We had to resort to her very first pair that were pretty small, and it took 2 weeks to get the replacement glasses! That’s unfortunate that you had to send them in but I am glad you were able to get them replaced! I only get my son’s glasses at Walmart. He bends them so out of shape that the frames are replaced 2-4 times before the year is up. They are really good at just switching them out. Hi Lisa. If you are still within the first 60 days, you can just return the glasses for a full refund or exchange. If you are past 60 days, the warranty doesn’t cover frames that just don’t fit well. If your frames got broken, they would replace them with the same exact frames, so that probably wouldn’t help. Hey! It sounds like your frame is too small. When it comes to little adjustments like that, though, you can usually just go in and ask them to help you if they are available, even if your glasses are not from Walmart. I went to Walmart on Beach Blvd, in Westminster, California at the suggestion of an EyeMed rep. THIS WAS THE WORST DECISION I HAVE MADE IN A LONG, LONG TIME. The young man who worked with me must have some kind of problem because he made three major errors and it was the manager who was, later, able to rectify the problem. I spent $216.00 on the lenses. The first error was the clerk had copied down the prescription incorrectly. Error two: I made certain he understood I wanted BIFOCALS AND NOT TRIFOCALS. Error three: I told him I must have titanium frames as I have a severe allergy to most cheaper metals. He ASSURED me that the frames I chose were definitely titanium. So I go to pick up the new glasses to find out the lenses were dreadful, they were trifocal and not bifocal, and the frames were definitely not titanium. Thank God the manager spotted that otherwise I would have had a real problem. The manager was very helpful and returned the order having helped me to find frames that are titanium. He could only apologize for all the problems and he was very gracious. In the meantime, the company contacted me to ask me to complete a survey but when I tried to call them back they did not recognize my phone number. This outfit is clearly underhanded and not to be trusted. However, I WILL NEVER EVER GO BACK TO ANY WALMART VISION CENTER NOR WILL I RECOMMEND THEM TO ANYONE I KNOW. In this day and age there Is no excuse for this kind of situation. I’m sorry you had such a rough time, Suzanna! I can only imagine the frustration! The walmart vision center employees definitely vary in quality. I’ve met some great ones and some awful ones. Paid $460+ for two pairs of bifocal glasses, one regular and one pair of sun glasses. Tried them on and everything was “dancing” around., couldn’t focus on anything in the distance, reading was fine. Was told I’d get used to it. They thought my doctor had made a mistake or that my prescription had changed! Told me to go back to my ophthalmologist and have another eye exam. The women we’d been working with at Walmart Vision center said I should have waited at least 8 weeks after my cataract surgery to get my prescription! THIS is BUNK! I Googled that and only 3 to 4 weeks is the required waiting time and my surgery was a month before I got my prescription. Tried to look through them at a couple of signs on the way home and saw DOUBLE SIGNS! I trust my ophthalmologist implicitly, he is one of the best in our area. I will go back and see him but I truly don’t think it’s his mistake. I’ll let you know what they intend to do about this after my return visit tomorrow. Oh man! That sounds rough! I hope they take care of you!